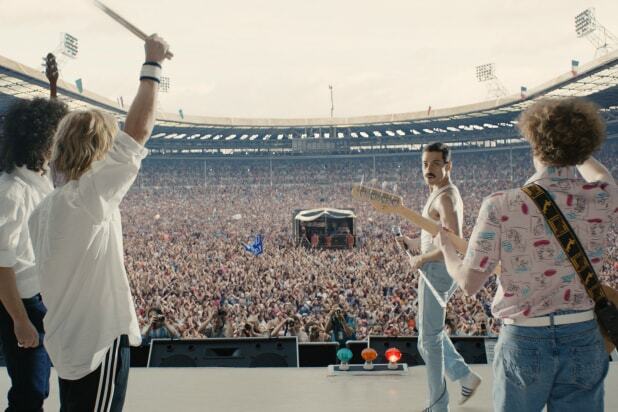 Critics will try and tell you that Bohemian Rhapsody fails to hit the mark when it comes to telling the story of the legendary rock band, Queen. I'm here to tell you that they are wrong. If you love Queen, you'll love this movie. Bohemian Rhapsody tells the tale of how five musicians: Freddie Mercury (Rami Malek), Brian May (Gwilym Lee), Roger Taylor (Ben Hardy), and John Deacon (Joe Mazzello) came together to form the timeless musical family known as Queen. A biopic exploding with the band's greatest hits and striking performance sequences, Bohemian Rhapsody takes fans on Queen's epic journey to stardom, making you laugh, dance, and cry in the process. As I sat in the theater, fighting the urge to get up and dance around the room à la Freddie Mercury, I was struck with how much I love this band and just how powerful their music can be. Needless to say, I knew that I needed to share my love for Queen and the movie that helped breathe new life into its legacy. The electric energy that seeped through the screen and into the veins of the audience was no fluke; it was because of the passionate performances of the brilliantly selected cast. Rami Malek unquestionably stood out from the rest in his portrayal of the heart and soul of Queen, Freddie Mercury. From the most intimate and minute mannerisms to his vibrant and intoxicating onstage persona, Malek became almost indistinguishable from the Freddie that the world came to know and love. Some critics, although impressed with Malek's performance, express disappointment in the PG-13 portrayal of Freddie Mercury's personal life and sexuality. While their disappointment is valid, I believe that this film was never meant to be about Freddie Mercury, but a movie about the family that he found within Queen. At the end of the day, this film is for fans of Queen, both old and new; so much so that fans were even given the opportunity to lend their voices to the film. The special relationship between Queen and their fans is perfectly summarized in the film when Freddie says, "Now we're four misfits who don't belong together. We're playing for the other misfits. They're the outcasts, right at the back of the room who are pretty sure they don't belong either. We belong to them". This idea is emphasized throughout the film and, as I looked around the theater to see people of all ages with smiles on their faces and tears in their eyes, is an idea that I know rings true. So, hats off to Bohemian Rhapsody and long live the one and only, Queen.